Well, Surreal Skin Argan Finishing Balm certainly has a name that drew me in. And when you try it, you'll see why this is a brilliant new skincare product. 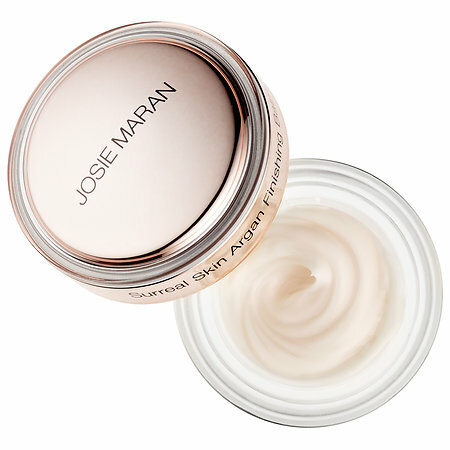 Josie Maran Surreal Skin Argan Finishing Balm is one of the newest Argan-based products in Josie Maran's lineup. Surreal Skin Argan Finishing Balm can be used as a primer before adding makeup, which gives a smooth, plumping effect to the skin. It can also be used after makeup has been applied, at any time in the day, to give natural glow. The Balm is light, smooth and silky, and immediately made my skin feel comforted and soothed when I applied in the morning after cleansing. It's also surprisingly concentrated, so only a pea-sized amount was needed when I used it either before or after my makeup. Surreal Skin Argan Finishing Balm gave me a very unique base to my skin which allowed my foundation or BB Cream to adhere to it instantly and keep my makeup looking fresh all day. without changing or disturbing my makeup. The finish used either before or after makeup was a natural matte. Before adding makeup, it smoothed out my skin's texture and it provided a light blurring effect on dark spots, redness and other small imperfections. At the same time, there a subtle layer of glowiness, which I loved, and what makes Josie Maran Surreal Skin Argan Finishing Balm so unique - matte AND glowing. My skin felt smooth, plump and soft all day and my t zone was not as oily as usual. I had no problems using either foundation or concealer over it and it didn't irritate my skin. For those of you who don't wear foundation, Surreal Skin Argan Finishing Balm can also be used on it's own, as well as a spot highlighter on cheekbones and brow bones when you want absolutely no shimmer, but a natural glow.